Mac users can now tell their computers what to do using Apple’s voice-activated assistant. This year’s update to the Mac operating system, macOS Sierra, marks the thirteenth iteration of Apple’s Unix-based desktop OS. It offers something for every user: refined and enhanced functionality throughout the operating system and its built-in applications, better integration with other Apple devices, and -- for the first time on the Mac -- access to the virtual assistant, Siri. It’s that last addition that represents the biggest change, though how useful it is will depend on how comfortable you are talking to your computer. Before starting any upgrade, I would recommend two things. First, make sure the hard drive and operating system on your Mac is in top shape. At the very least, run Disk Utility (it’s in the Utilities folder) though I highly recommend Alsoft’s DiskWarrior instead, because it’s more thorough in picking up little problems and fixing them. Second, back up your files. I know it’s a pain and can take a while if you don’t routinely do so, but it’s less painful than an installation error resulting in data loss. When ready, use the App Store to kick off the Sierra download and installation. 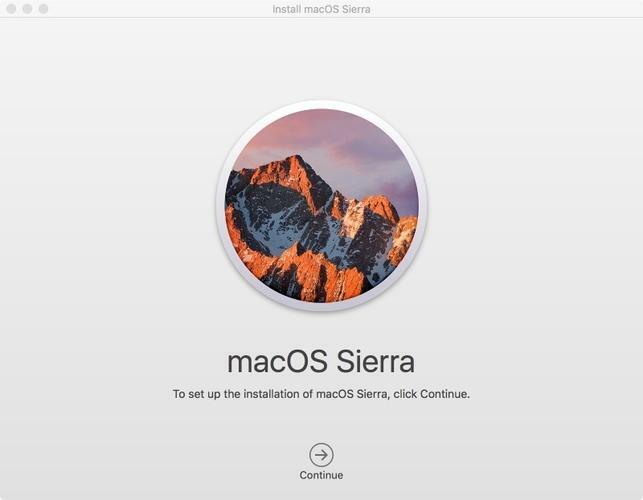 The Sierra installer software downloads to the Applications folder; if you have more than one Mac and don’t want to download the multi-gigabyte file repeatedly, copying it to your other Macs (via AirDrop in Finder or with your trusty USB drive) will save time. Make sure to do this before the update starts, because the installer will delete itself upon completion. Then launch the installer, select the hard drive to be upgraded, click Agree to license agreements you’ll never read, and let the installer do the rest. Once Sierra is up and running, the desktop interface should be familiar to Mac users. There are few big interface changes in this version; Sierra instead promises a more polished Mac experience. The most obvious, and potentially useful feature, is Siri. After five years as a tent-pole feature of its mobile devices, Apple’s virtual assistant is now on the Mac for the first time. Siri on the Mac brings about the functionality found on the iPhone and iPad, but with some useful Mac-specific features. Now you can truly multitask. Why stop writing that document to send a message when you can just speak the message out loud? Siri appears in the upper right-hand corner of the menu bar -- centered between the Notification Center and Spotlight menu icons -- and can be triggered via an icon in the Dock, the menu bar icon or a hot key. Siri on the Mac brings about the functionality found on the iPhone and iPad. Siri essentially replaces Spotlight -- or at least enhances it -- and can be used to find anything Spotlight could, as well as everything you’d expect from Siri on the iPhone. These include looking up sports scores and athletes’ stats, sending messages, getting weather information, launching apps, creating Reminders and Notes, telling jokes…it’s all here. And more. 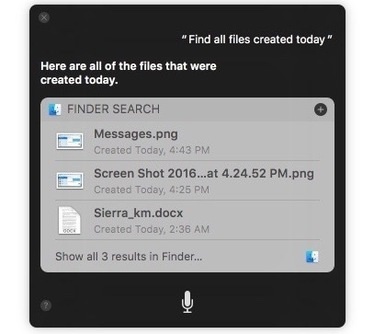 Siri can replace typed Spotlight queries when you’re seeking specific files or documents: Instead of typing, just say out loud what you’re looking for. Siri understands and searches through Finder tags and other file attributes and metadata, which means searches can be performed for files of specific sizes, data types, created or modified dates, and more. Because it’s Siri, follow-up questions can be used to narrow search results further. Even better, the results can be saved for future reference. To the upper right of Siri’s search results, there is a plus sign that allows you to pin those results to the Notification area for later retrieval. (Notifications are off-screen, to the right of the display, and are called up using the icon located at the right end of the menu bar.) And those results are live, so any document created after the fact that fits that criteria will show up automatically, a boon for people who perhaps aren’t as organized as they could be. These results can be dragged to the Desktop, any folder, or into any app -- say, as an email attachment. This works well for photo searches, too, both local and online. Siri is a bit quirky. For instance, when I asked it to open System Preferences, it said it couldn’t, but when I asked it to open the System Preferences app (which is the same thing), it opened the app immediately. However, it does quickly respond to opening specific System Preferences. So instead of telling Siri “Open System Preferences app” and then mousing to the selected preference pane, you can just tell Siri to open a specific preference pane like Displays, Parental Controls or Users & Groups. I’ve been trying out Siri on Sierra for several months -- as have Mac users who took part in Apple’s macOS Sierra beta program -- and I definitely find Siri useful…when I remember it’s there. It’s a hard habit to get into -- remembering that the MacBook Pro can respond to voice commands. One thing Sierra could really use is the “Hey, Siri” voice activation feature found on the iPhone. I wouldn’t be surprised to see something like this show up in the next MacBook Pro update, which is rumored to arrive later this fall. Despite these quibbles, Siri goes a long way to improving the computing experience. Go ahead. Talk to your Mac. You might find this a real time-saver. In Sierra, the Photos application gets an upgrade that keeps some features on par with its iOS counterpart. As with the iPad and iPhone version, Photos for Mac can now parse photos using scenery, location and people data, and those results can be called up in searches via Spotlight or Siri. Other additions include People and Places smart albums. The People album groups photos based on facial recognition scans; the Places folder groups your photos on a map based on their GPS data. These two features should make it easier for cameraphiles to organize their photos. Another commonality with the Photos in iOS 10 is the new Memories tab. It showcases collections of photos and videos based on events, places or specific time frames. (Users can’t tweak these settings.) Beneath each collection are sections that display individual people, a map with the spots the photos were taken, and photo albums of potentially related photo clusters. In other words, Photos has gotten a lot smarter about finding and grouping photos in ways that will be useful to most people. It really can help you rediscover moments that might otherwise remain hidden. 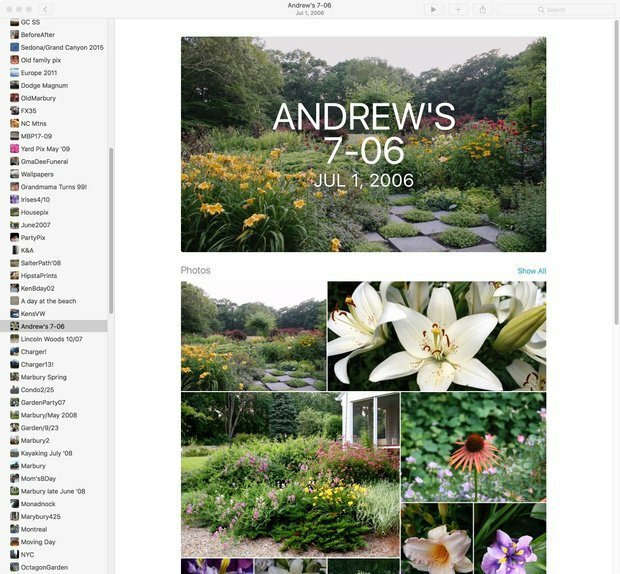 Photos in iOS 10 showcases collections of photos and videos based on events, places or specific time frames. But it’s not as comprehensive or as powerful as the iOS version and there are two noteworthy gaps. First, the iOS version of Memories creates movies based on the event media, grouping photos and videos into one uber-video; that option is completely missing here. More annoying: I spent hours setting up the People album on my iPhone once iOS 10 arrived. Then I had to do it again on my laptop because this information isn’t synced between devices, even though they all reference the same iCloud photo library. I don’t know why this information isn’t transferred to iCloud and then propagated to other Apple devices. But after spending the time building the People database on my iPhone and now on my MacBook Pro, I refuse to do it again on Photos for my Mac mini. It’s a glaring omission. Mac users who have other Apple devices like an iPhone or an iPad are already familiar with Continuity, even if they don’t realize it. Continuity is a group of features that enables Apple devices to talk with each other, including Handoff (in which you start a document, email or other item on one device, like an iPhone, and continue on another, like a Mac); Calls and Messages (in which an iPhone forwards phone calls and SMS messages to other devices); AirDrop (for wireless file transfers); and Instant Hotspot (which lets an iPhone or iPad act as an internet hotspot without any configuration). If you are an Apple Watch user, you can use the Watch to unlock a Mac running Sierra from sleep or a screensaver automatically. In addition to the Continuity features introduced last year, Sierra expands the technology with even more device intercommunication. First, if you are an Apple Watch user, a Mac using Sierra can use the Watch to be automatically unlocked from sleep or from a running screensaver. For this to work, the Watch must be on your wrist and unlocked, and the wearer must be within about a foot or two of the Mac, as the unlock is based on signal strength. 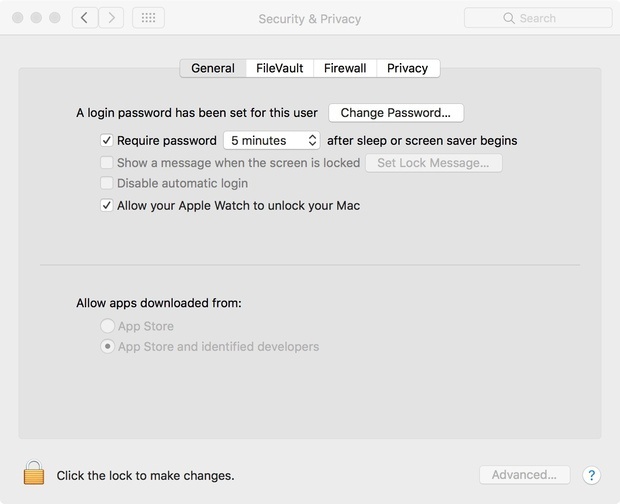 You can enable this feature by checking the “Allow your Apple Watch to unlock your Mac” box under the Security & Privacy System Preference; you’ll be prompted to enter your account password, and then the Mac will configure itself to allow the automatic login. Another great feature new to Continuity is the Universal Clipboard. Once upon a time -- back in 2007 -- the iPhone couldn’t cut/copy/paste. Now, you can cut/copy something on one device and paste it on another device. That’s Universal Clipboard, and it works really well. The only caveats are that the devices need to be within Bluetooth distance of each other and the data in the clipboard only stays there for two minutes before timing out. Apple Pay, until now, has been limited to devices with Touch ID authentication; now, it’s finally coming to Macs -- as long as you own a device with Touch ID and are purchasing online. Just click “Buy with Apple Pay” in a web-based store on the Mac. Your Watch or iPhone will buzz and ask you to authenticate; use Touch ID on the iPhone or a tap on the Watch face. After that, the Mac receives the okay, and the order is processed. No addresses to be inputted, no credit card information to enter, and you have the security of Apple Pay. Using Apple Pay like this shows how device connectivity can be useful, but it’s also a bit kludgey, because you need two devices for the system to work. Still, implementing Apple Pay like this opens current and previous-generation Macs to Apple Pay purchasing. While it’s an important move given Apple’s efforts to build its mobile payments ecosystem, it also seems clear Apple is setting the stage for future Macs with Touch ID sensors built in. If you’re an owner of multiple Macs, Shared Desktop and Documents will be instantly useful, even if it’s a potential concern for the IT department. With this feature enabled, everything in your Desktop and Documents is synced across all devices. This can be set up to work in two ways. First, all Desktop and Document items are transferred as is; what you see on one desktop you see on all desktops. While extremely useful, this sharing could run afoul of IT rules for data protection in the workplace. Files in Documents and Desktop could end up duplicated across multiple computers, some of which might not be safe for corporate data. The best thing for IT shops to do is make sure users don’t turn on that feature. In iOS 10, the Messages app got a thorough revamp to make it more fun and interactive with a variety of ways to respond to people beyond just sending texts. But Messages on the Mac does not support the iPhone’s new animated effects. In Sierra, Messages that have been sent to you with animated effects just plainly state, in straightforward text, that so-and-so sent you a message with Fireworks. For a feature that’s designed (in iOS 10) to add a bit more emotional punch, the Mac interpretation is incredibly flat. “Your girlfriend sent a message with a shooting star.” For some reason, my mind always reads these descriptions in Ben Stein’s monotone voice, for added dryness. Come on, Apple -- show, don’t tell. Even the Watch can display Message animations, so I’m pretty sure Mac hardware can handle it. I imagine that adding these Screen effects to Messages on the Mac is on Apple’s to-do list, but just wasn’t a priority this time around. The oversight is odd -- though at least you can click on a text message for TalkBack options like a thumbs up or down or a heart symbol. If your Mac is running out of space, the new Optimized Storage features allow you to better manage data and disk space. These tools include uploading infrequently used data to Apple’s servers, saving space on local storage; there are options to remove iTunes media from your machine. (Like other files, your iTunes purchases can be retrieved later and re-downloaded.) If you want to take a glance at how much data you could save, click the Apple Menu > About This Mac, select the Storage tab and then click Manage. Almost every Apple app supports tabs now, making it easier to navigate through documents and files. HTML5 videos on the web can now be placed into Picture-in-Picture mode, as a floating window above other windows, something borrowed from iOS. And you can now share Notes with others, which enables simultaneous real-time editing. One of the reasons I’ve been using Apple hardware through the years is because each device stands on its own but is also, increasingly, a piece of the larger tech puzzle. The various sharing features in Sierra further this trend. You don’t need to collect all of the devices Apple sells to be functional, but each adds an extra layer of functionality that serves to complement the whole. Sierra, working well in concert with iOS 10 (and watchOS 3), does more of that, better and faster than before. While macOS Sierra is short on major “wow” features, it’s long on usability tweaks and refinements that will matter more over the long run. It still falls short on some of the features found on Apple’s mobile platform, though, including the lack of HomeKit support for controlling IoT linked devices; the missing Memories features in Photos that share dynamically created movies; and the lack of Screen and Bubble effects in Messages. Apple has in the past moved its development teams to different software areas that needed reinforcement, and it’s time that macOS gets some of that attention, too. Note to Apple: At least put macOS on par with iOS. Yes, the world is all about mobile now, but millions of desktop users are still plugging away on their iMacs and MacBooks. That said, macOS Sierra is fast and offers a few major features that make it worth the upgrade. After many years of testing and reviewing Apple’s operating system releases, I’ve got to say that this year’s crop, from macOS Sierra to iOS 10 to watchOS 3, has been relatively stable compared to years past. And given how well the trio works together, it makes upgrading to Sierra a common-sense move.